When building or remodeling a bathroom, homeowners have shied away from using hardwoods as a flooring option. The mantra that designers and architects have stuck to is “wood and water don’t mix”. The inevitably humid environment in a bathroom, as well as unavoidable spills and splashes, have the power to warp or cup the wood flooring. In some cases, the moisture renders the floor unattractive and can encourage the growth of potentially destructive and dangerous molds. While this is definitely a potential risk, there are ways around it. To start with, it’s important to choose an appropriate type of wood to use. Choose a hardwood floor rather than a softwood floor, as softwood tends to absorb more ambient moisture, making it vulnerable to damage. Particularly resilient and strong woods that could work in the bathroom are oak, maple, cherry, ash, and hickory. 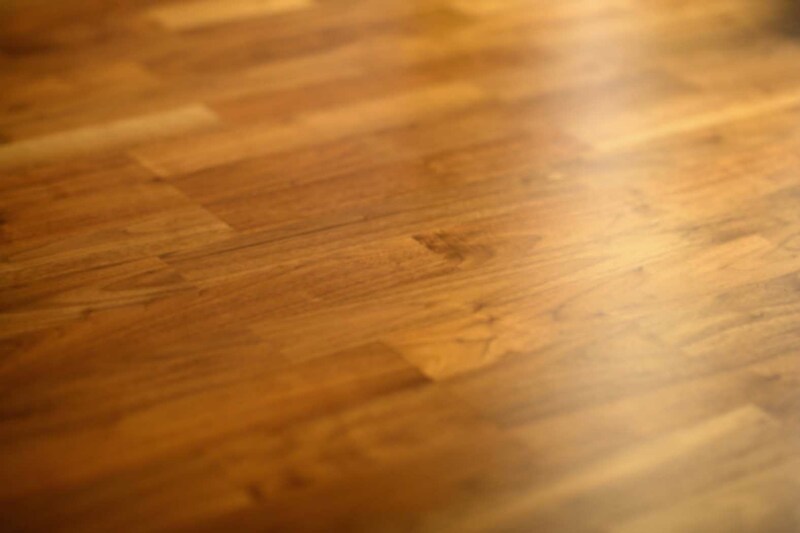 Swedish or polyurethane finishes on the hardwood floors make the floors resistant to average bathrooms – except, of course, unceasingly humid and wet conditions. This finish uses synthetic resin, plasticizers and other film-forming elements to form a watertight seal that remains intact, without peeling, when the wood expands and contracts. Even with this finish, certain precautions need to be taken in the bathroom. For example, significant and even small spills should be cleaned up quickly. Leaks from the tub and toilet need to be addressed immediately… something that should be handled regardless of the flooring you choose, but particularly important with wood floors. 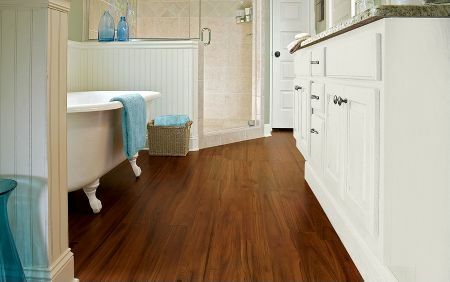 Other minor additions in your bath could add protection for your hardwood floors and make maintenance a little easier. For example, placing mats with rubber bottoms around the wet areas like the toilet, tub, or shower. These will give a permanent moisture absorber that will save you the trouble of running around paranoid and wiping up every tiny splash. It is also beneficial to hang dry your mats when they get wet to insure no water is trapped between them and the hardwoods. Another similar solution is installing a strip of stone or ceramic flooring around the wet areas with hardwood in the rest of the space. This will provide you with a completely water resistant area in vulnerable parts of the bathroom while still adding to the overall design. Hardwood floors give rooms the look of warmth and style that is unmatched by any other material. The physical warmth that the floors provide is also an attractive feature, especially on winter mornings when the cold ceramic tiles make getting up that much harder. Their unequaled versatility, style and adaptability have made them a prime material for every other room in the home, and now new finishes are making hardwoods in bathrooms a realistic choice as well. I love how my floors look! Thanks for doing a good job.